Congratulations to Steven and Lisa R. on their beautiful new home!! This Gorgeously Renovated Home in a Prime Downtown Location just went under contract! Congrats to Eli and Lindsay H.
Congrats to Steven and Tamika M. on the move to their beautiful new home in Durham!! Congrats to William E. and Heather D. on the sale of their town home and on their move! 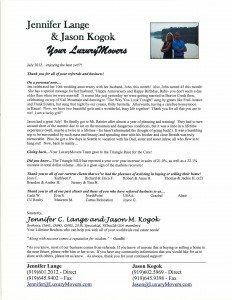 We would like to thank Stephen and Laura R.
for allowing us to help them sell their home and to buy a new home in Wake Forest! Congratulations to Brandon and Amber H. on the sale of their Raleigh home!! Price has been reduced by $16k !! A must see . Located at 329 Heather Bluffs Dr, in Clayton this home is now listed at $359,000!! Your LuxuryMovers Team would like to congratulate Vincent R. on his new home!! Price reduction on 293 Windgate Dr. to $199,000 !! Spacious floor plan that features 4 bedrooms with the master suite on first floor. Great kitchen w/island, pantry & breakfast nook. Huge bonus room upstairs, plus walk-in storage room. Also has a separate laundry room. Plantation Pointe offers swimming, tennis, playground & walking trails. This is a must see! !